I'm often asked about how to learn the fretboard and what my approach is when it comes to soloing and improvising. 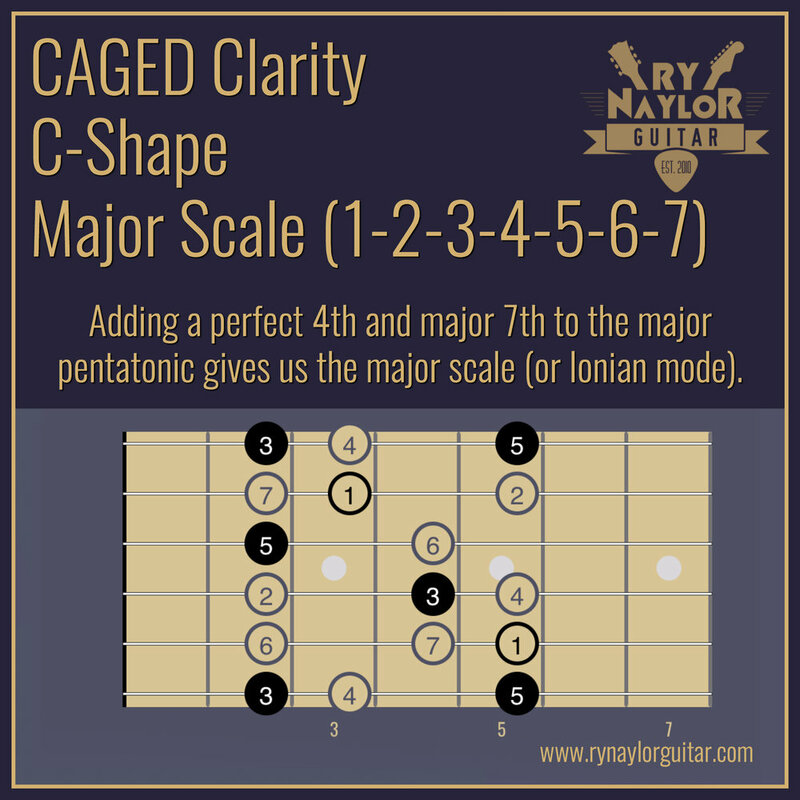 For me, the best approach is the CAGED system, in which we compartmentalise the fretboard according to a series of octave shapes around which we can form chord shapes, arpeggios, triads, pentatonics, and diatonic scales. I have a new series of posts on my Instagram feed named CAGED Clarity to explain this approach in more detail and how I like to progressively present it to my students. All of the examples that you can find below take the 'C-shape' in the key of D major. 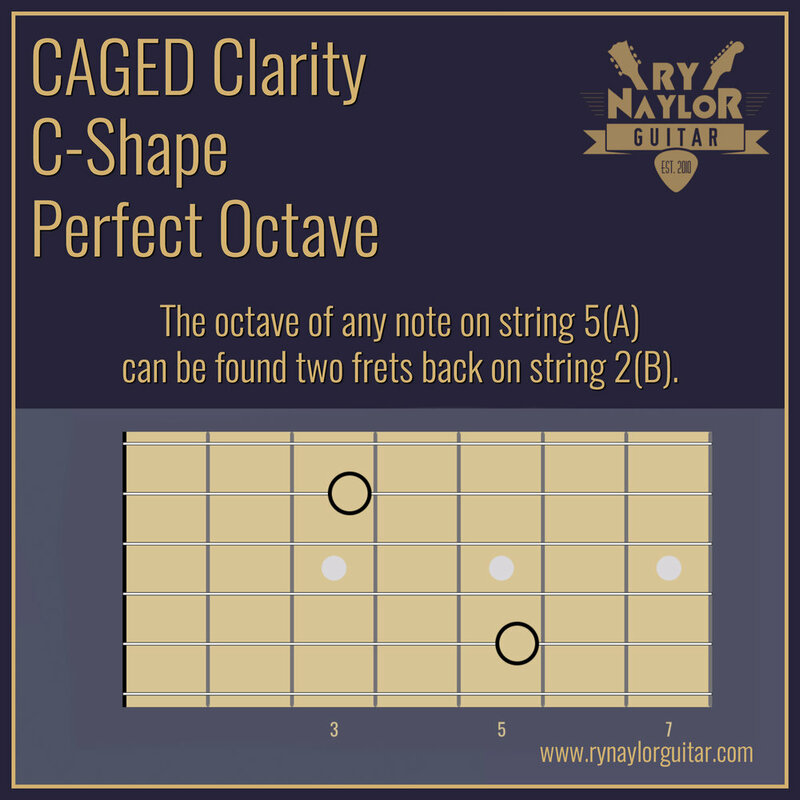 The starting point for this 'C-shape' approach is the 5-2 octave shape. Any note found on String 5(A) can be played an octave higher by going back (towards the nut) two frets on string 2(B). 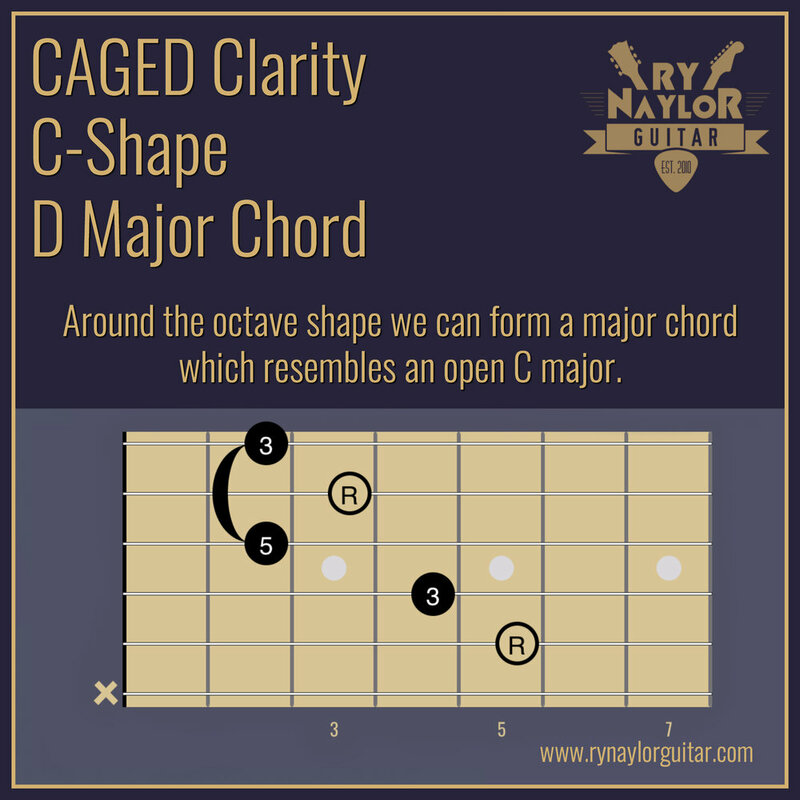 Around the octave shape we can superimpose the shape of an open position C major chord. Hence the ‘C-shape’ name. When doing so there is a barre finger required to fret strings 1(E) and 3(G) which are open strings in the open position C major. Finger two will grab the root note on string 2(B). Finger 3 will fret the major 3rd on string 4(D) and finger 4 will fret the root note on string 5(A). It is as if we are playing a C chord with a capo at the 2nd fret. The root note is now a D at the 5th fret of string 5(A) so this is a D major chord (but in the C-shape). The C-shape chord is one of the easiest when it comes to playing arpeggios because the intervals of the chord (Root - major 3rd - perfect 5th) are found in order across the strings when we start from string 5(A). The arpeggio falls nicely inside a 4-fret radius and we can reach for the 5th on string 1(E) at the 5th fret with finger 3 or 4. Whilst the tonic is on string 5(A) the arpeggio can continue in the lower octave on string 6(E). Notice how the notes on string 6(E) will always be the same as string 1(E). Seems obvious but often overlooked when learning patterns on the fretboard. Also, I don’t like to use the term ‘Root’ when it refers to melodic playing. The Root is the starting point for a chord. When we think about melody, this note (is these examples D) is called the 'tonic' and I will use the abbreviation ‘1’ instead of ‘R’. One of the immediate benefits of the CAGED approach for rhythm playing is the ease at which we can visualise triad shapes. The major triad consists of three (hence tri- ) elements: The Root note (D), a major third above the Root (F#) and a perfect 5th above the Root (A). There are four possible grips for these three notes across the 6 strings. With our Root note on String 5(A) this first shape has the 5th as the lowest note in what is called a ‘second inversion’ of the triad (or D/A - D chord over an A bass note). These triad shapes are known as closed voicings in that the notes will appear in order (5-R-3, R-3-5, 3-5-R, 5-R-3) and are as close as they possible can be to one another. Raising the 5th an octave from string 6(E) to string 3(G) gives us a closed voicing of a Root position major triad (I.e. the Root is the lowest note played). Raising the Root an octave from String 5(A) to string 2(B) creates a great voicing of a ‘first inversion’ triad (D/F#) in which the third of the chord is the lowest note played. Remember to try and visualise the full chord shape as you play this to know where the other chord tones are. Raising the 3rd an octave from String 4(D) to string 1(E) creates the much-loved D major chord, except that without playing the open string 4(D) this is a moveable second inversion major triad shape (D/A). This is where things get interesting. Let’s take it back to the major arpeggio pattern. We have three notes, the tonic (1) major 3rd (3) and perfect 5th (5). Playing those three notes together gives us the sound of the major chord (major triad). BUT if we add an additional two notes we will have a total of five notes…’penta’-tonic. Adding the major 2nd and major 6th will give the five notes of the major pentatonic. At each stage we’re building upon the octave shape and chord. Therein lies the power of CAGED approach and why you should learn this stuff! From the five notes of the major pentatonic we add an additional two to give us a seven note diatonic scale (with each letter of the musical alphabet being present within one octave). The two notes we add are the perfect 4th and major 7th to give us the sound of the major scale (also known as the ionian mode). The other major modes (lydian, mixolydian) can be created in the same way. For lydian we would add an augmented 4th and major 7th, mixolydian has the perfect 4th and minor 7th. I'd love to take any questions in the comments of this post. 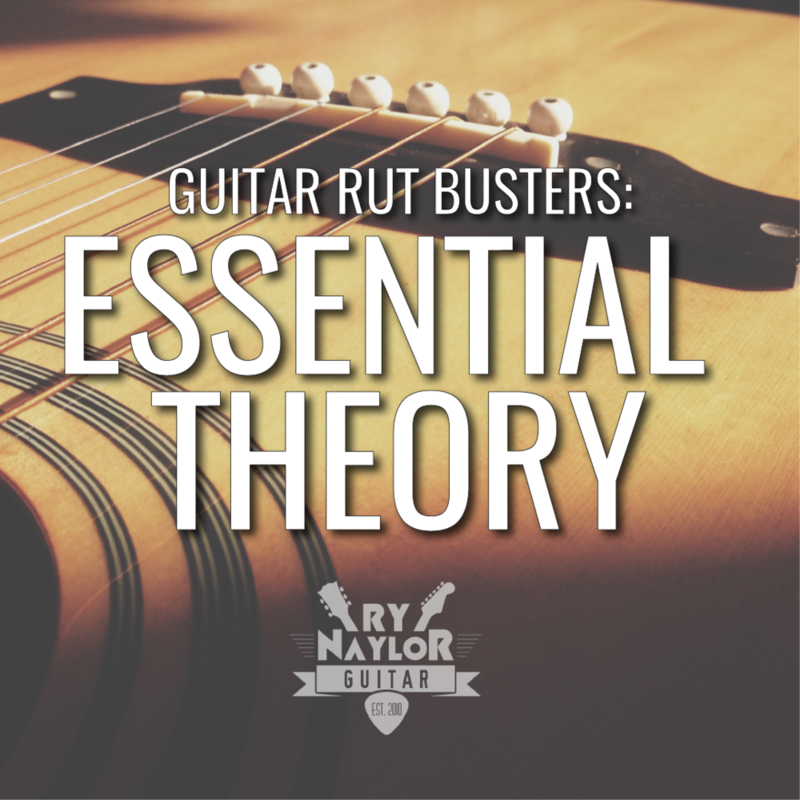 If you're desperate to get learning the fretboard I have a free eBook available to all email subscribers. You can get your copy of 'Fretboard Mastery' here. Here is my new song lesson on 'Low Life' by Jamie N Commons. This was a request from one of my subscribers, Shaun Gimbitt. There is a lot of chord embellishment in the original version with hammer ons and sus chords. My lesson here presents the chord progressions and then a 16th note strumming pattern that closely resembles the feel of the song. You will find the chord progressions below. Click on the image for a .pdf to download.